The long axis of the lake runs approximately East-West (bottom-left to top-right in photo). The lake is surrounded by low ridges, is shallow, and therefore is well mixed by both wind and tide. 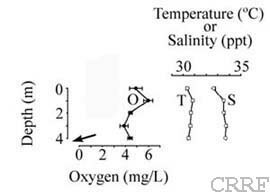 Vertical profiles show Ongael Lake is essentially isothermal and isohaline with depth (figure below) and oxygen maxima and minima therefore are probably attributable to biological activity. Visibility generally is quite poor, but the Secchi disk depth exceeds the depth of the lake, and this is reflected in the occurrence of the photosymbiotic upside-down jellyfish (Cassiopea sp.) throughout the sandy basin. Mastigias sp. and Aurelia sp.4 also occur in this lake. However, in contrast to jellyfish populations in other Ongeim'l Tketau and Big Jellyfish Lake, the populations in Ongael Lake appear to go through >=1 boom-bust cycles per year. Chlorophyceae - Caulerpa sertularioides, Cladophoropsis sp., Halimeda sp. Scyphozoa - Aurelia sp.4, Cassiopea sp., Mastigias sp.